Sunrise behind the Iswari Minar Swarga Sal Minaret in downtown Jaipur. 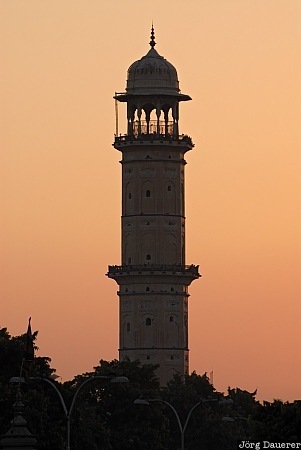 Iswari Minar Swarga Sal is also known as Heaven Piercing Minaret. Jaipur is the capital of Rajasthan in northern India. This photo was taken in the morning of a sunny day in October of 2007. This photo was taken with a digital camera.